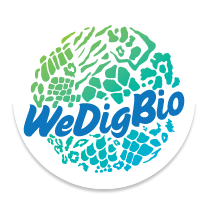 In 2015, we launched our first WeDigBio event back when Notes from Nature was still on version 1. Back then it was a real challenge launching new expeditions, but we managed the awesome “Crab Shack” expedition from Los Angeles County Museum of Natural History. After we transitioned to Notes from Nature 2.0, we had an amazing turn out for WeDigBio in 2016. On our best day, we had 3,279 transcriptions and, over the four-day event , over 11,000 total transcriptions and – at the time – a record 23 active expeditions. If 2016 was awesome, 2017 blew us totally away. Instead of falling back to Earth, we had 8395 transcription IN ONE DAY – still a record! NfN had over 20 expeditions active during the event with over 19,000 transcriptions completed over the four-day event! Here we are in 2018, just one day before launch. How will we do this year? How much can we support the global effort to digitize our irreplaceable biodiversity legacy? Please consider even pitching in one transcription. Each note you take helps make an impact. We finished the Predicting Past and Present Phenology expedition last week. Thanks to everyone who took part and helped us get this large expedition completed. The expedition was no doubt a challenge (!) and we really appreciate all the folks who stuck with it. What we learned is that not only is it very challenging to score phenology sheets, especially without stronger tutorials and other rubrics in place to help guide you – but it really does vary by taxonomic group just how challenging this is. We couldn’t have guessed this, but Hamamelis virginiana (American Witch Hazel) and Taraxcum officinale (the dandelion) were by far the hardest ones to get right. By contrast, Amelanchier canadensis (known as the Canadian serviceberry) had an 85% unanimous match rate. So what are we going to do with these results? We may be going back to the drawing board a little bit — since we recognize the challenge with scoring “mostly open flowers”. Instead we might ask for just noting if there are any open flowers (or unopened flowers or fruits), as we have in the past. We are also certainly going to be focusing on the species below that had the best results from this trial. Herbarium_The Meandering Mallows of Malvaceae. 88% complete. 949 transcriptions to go. Herbarium_Field & Forest Plants of Virginia I . 89% complete, 1559 transcriptions to go. Herbarium_Understanding A Critical Symbiosis: Nitrogen Fixing in Plants V – East Coast Edition. 94% complete. 235 transcriptions to go. Pinned Specimen_CalBug Leaf-cutter Bees 10. 94% complete, 1288 transcriptions to go. Labs_Predicting Past and Present Phenology I. 90% complete. 908 classifications to go. It looks like “Understanding A Critical Symbiosis: Nitrogen Fixing in Plants V” has the best shot at finishing soon, but who wins this race? Who comes in 2nd? We hope you’ll help your favorite expedition finish, which also helps us push to get more new related expeditions up and running sooner. We have launched a number of recent phenology expeditions, as experiments and under our “Labs” section of Notes from Nature. We have gathered some great data from those efforts, and we are now excited to expanded further here, related to two ongoing on research projects. Our first attempt at expansion is now posted as a new expedition entitled, “Predicting Past and Present Phenology I”. So let’s talk about how your help can move forward some great science and informatics endeavors. The first project is related to work to integrate phenological information coming from multiple sources. Over the past few years, we have been working on building data integration tools in order to bring together data from two different and major observation networks, the National Phenology Network (npn.org) here in the United States, and the Pan-European Phenology Network (http://www.pep725.eu/). Integrating these data is longer, neat story that involved building an ontology for plant phenology (https://www.frontiersin.org/articles/10.3389/fpls.2018.00517/full) and using a set of cool tools to end up with a new portal to find integrated phenology data (plantphenology.org). We are excited to now integrate herbarium data with the observation records as a next step. That will require some extra effort, since herbarium sheets only show parts of plants, not the whole plant, but we are working on the logic of how to do this. And we want to showcase citizen science efforts to help build these coordinated data resources, which is where you come in. We’ll be integrating the results of your efforts right into plantphenology.org! We are also working on a project looking at how regional urbanization along with climate change can both impact phenology. Urbanization can impact phenological timing of plants via especially increasing temperatures through the urban heat island effect. How such urbanization and overall climate changes impact phenology can be examined in the present looking at spatial patterns, but its very exciting to also be able to look at these questions temporally as well. How have trends over time in urbanization impacted phenology trends e.g. earlier flowering. Herbarium specimens can provide that critical look at the trends across time. We have explicitly chosen groups with relatively rich records in the 19th and 20th centuries that are also well studied today. We will presenting some of the results of this work over upcoming blog posts. A couple notes about this expedition and the ones to follow. First, we are still experimenting with how to best capture phenology information from specimens, and feedback on how easy or hard you find the expedition(s) is much appreciated. Second, we have decided to present more than one taxa in the same expedition. We know this makes it challenging, and if you have issues, please let us know. We haven’t provided extensive help per species, but have tried to point you to some possible sources to check out more information. Our next expedition featuring plants from the Nitrogen Fixing clade is here! As you know, we have been busily collecting samples from herbarium specimens that will be used to look at the genomes of these plants. We are looking in particular for the genes that are responsible for creating the root nodules that house nitrogen-fixing bacteria. This symbiosis has allowed plants with these nitrogen fixing bacteria to survive in places where they usually cannot. We plan to look at a portion of the genome for more than ten thousand species of the 35,000 or so in the nitrogen fixing group (which forms a natural grouping). The photo below shows two of our champion samplers during our best day collecting ever – 322 species were sampled. When we sample, we have to look through folders of herbarium sheets to find specimens that are relatively recent and that are in good shape for taking a small piece of tissue. The specimen photos you are helping to digitize all have QR code coin envelopes in them, as you have noticed, and those are the same envelopes (with a little bit of tissue tucked inside) as in the photo. This new expedition (the third Nitrogen Fixing expedition) features specimens from the Missouri Botanic Gardens (MOBOT), which houses a fabulous collection of plants from around the world. MOBOT has databased a lot of their material, and for us to be able to access databased specimens, we need to be able to reference the last name of the collector of the specimen and the collector number. This makes for a fast expedition since those are the only two pieces of information we need right now. We also hope you like learning about this remarkable group of plants, and we appreciate the help unraveling one of the most successful symbioses on the planet. Can you spare a few moments to help identify flowers on images of museum specimens? We need help with a simple task, which will assist researchers who are studying phenology (cycles of events in the natural world). All you need to do is download the Zooniverse mobile app, load up our first ever fully mobile expeditions, and swipe right if you see flowers and left if you do not. It may be simple, but it will be a huge help for science. The species we’ll be focusing on is called evening primrose. The flowers of the evening primrose open quickly every evening, earning this plant its name. Its flowering phenology is broadly late Spring through Fall but we don’t yet know much how that varies across geography and during different years with different weather patterns. Download the Zooniverse app from Google Play or the App Store. Select Nature and scroll to Notes from Nature. You don’t need to create an account if you don’t want to. Read through the short tutorial. Be sure to check out the directions by clicking the “?” next to the question. After that you will see an image of a plant specimen. Can you see flowers? If yes, swipe right, and if no, swipe left. You may need to zoom in to check for flowers. You can tap the image to engage the zoom feature and then use normal gestures to zoom in or out. We know some folks have helped with this project using our web application, and that is still up and running as well. Thanks for your time! If you enjoyed this project, then please check out notesfromnature.org.